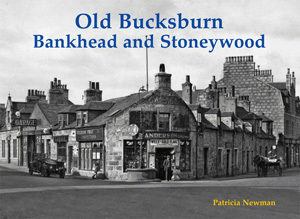 Patricia Newman’s latest Aberdeen book deals with the northwestern districts of the title. At one time these were separate places from the city although Aberdeen trams ran to Bankhead from Woodside and to Bucksburn. Although there was quarrying in the area and paper mills, and photos of these are included, these industries sat in an otherwise rural landscape. The street scenes in the book look like those of villages as they are not part of the continuous conurbation of today’s Aberdeen and its busy roads. As well as the places in the title also included are Newhills, Mugiemoss, Persley Den, Four Mile and Craibstone.